There are many things about depression you must know. There are many facts and figures about depression, which may shock you. Depression can be really dangerous if not cured at an earlier stage. Depression can disturb a person both mentally and physically. In this post, we are going to tell you the things about depression you must know and some tips to deal with depression. However, before starting, we must know what is the difference between being sad and getting in to depression and when does a person goes into depression? When does a person go into depression and how does it differ from being sad? Sadness is totally different from depression. Depression directly means no interest at all in anything, while sadness is disinterest from something in particular. Also, grief is different from depression as grief stays for a day or two while depression can stay for as long as for weeks and months. Although, sadness and grief may lead to depression. Till now, medical science has not found the major and the main cause of depression, but most of the time it is the psychological factors which causes depression. A person’s environment in which he lives, the society and people around him, the work he does etc. are the factors which can be the cause of depression. Loss of a loved one, breaking up with the partner, losing a job, getting bankrupt, not achieving what one dreamt of are the few major reasons for a person getting into depression. Feeling of suicidal or to remain alone. Constant headache, body pain, cramps and digestive problems. Anxiety, emptiness and urge to just sit on the couch and do nothing. You are not alone: There are about close to 10 percent people in the world who are suffering from major depression at any point of time and almost 15 percent people will go into depression for some time in their busy lives. Depression affects a huge 121 million people across the world and two of three persons suffering from depression don’t even get proper treatment. Depression causes many deaths: The one of the most important things about depression you must know is that a depressed person is 5 times more likely to commit suicide as compared to an average normal person. 35,000 people commit suicide each year just because of depression. Depression makes you lose everything: Person suffering from depression not only loses his health but also becomes mentally weak. Apart from that, a person suffering from depression can lose a hefty amount of $10,400 per year by the time he comes to the age of 50. Another surprising fact is that the depression is also the leading cause of losing productivity at the workplace. It is also the leading cause of medical disability for person’s age between 14 to 44. A depressed person have more chanced of heart attack and strokes. Depression can come at any age: While the average age is considered as 32, it was found in a research that 1 out of 10 teens will suffer from depression by the age of 18. Women are twice as likely to get depressed as compared with men. Depression can be genetic: Yes, a depression can be inherited or given to future generation. However, it is not so common and very few cases are there where depression have run in families as the genetics of depression is way more complicated than that of the eye color. Get some sleep: When a person feels depressed, the sleep cycle gets disturbed a lot. There are chances of no sleep at all. So, the very first thing is to get some sleep. At least 8 hours of sleep per day is must to deal with depression. Go out and explore: Another problem of a depressed person is that he makes himself home sick. Try to go at some place, plan a trip with your friends or family or just visit the nearest park. It is medically proved that lack of sunlight increases the chances of getting depressed and just worsen the situation. Read Novels and watch movies: Yes, it can really help. Although, you can go for books like The Monk who sold his Ferrari and movies like Pursuit of Happiness. This will not only divert your mind but will also give you the reasons to move on. Work on your hobbies: The perfect way to overcome depression. Everyone wants to excel in their hobbies. If you don’t have any particular hobby, then develop one and work on it. You can learn cooking, gardening, painting etc. Contact a doctor: If nothing works, then you really need to consult a doctor. There are many anti depression therapies which helps a lot. Remember that you are not alone and it can be cured. 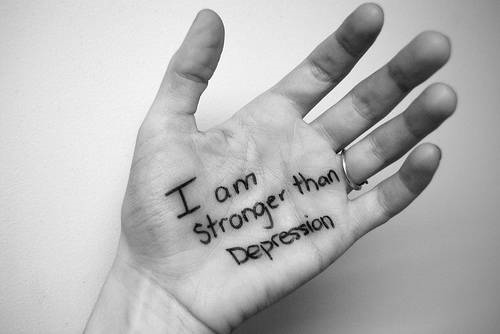 With full dedication and support from your loved ones, you can easily beat depression. This post focused on things about Depression you must know and tips to deal with depression. We wish you a fast recovery.